Looking for a Christmas party venue? 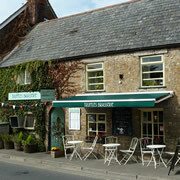 Consider Truffles in Bruton for lunch or dinner for pre-booked parties till December 24th. Our three course menu is just £26 per person or £13 for children Under 12. Celebrate Mothering Sunday at Truffles in Bruton with a three-course set menu for just £19.95 per person (£10 for children). Truffles brings you a typical French style Mothering Sunday menu with plenty of choices to suit all tastes. For your office Christmas Party try one of our two-option party menus at Truffles, Bruton for Lunch or Dinner for pre-booked parties from December 1st – December 24th. 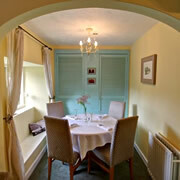 Two course menu just £16 or a fuller menu for £28 per person. Celebrate Mothering Sunday at Truffles in Bruton with a 3 course set menu for just £18.85 per person (£9.50 for children). Truffles brings you a typical French style Mothering Sunday Menu with plenty of choices to suit all tastes. Truffles' Taste of the West Christmas party menu is available from 1st – 24th December for Lunch or Dinner. The menu at £19.95 uses locally sourced fresh produce from West Country farms and artisan suppliers. Having recently celebrated its second anniversary, Truffles Restaurant in Bruton has plenty to offer both old and new customers. Look out for Lobster Nights and Dinner Deals every Wednesday, plus Bruton Business Club drinks meeting on Thursday 21st August. 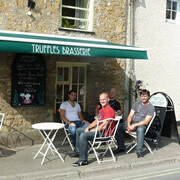 Celebrate Bastille Day on Monday evening, 14th July at Truffles in Bruton. Truffles offers an enticing mix of French dishes in a special hot and cold buffet. 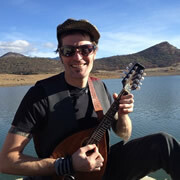 Also live Breton mandolin music from Daygan Robinson of Dragonsfly and Celtech. It's Party Time at Truffles! We will be running Christmas Party menus for both lunch and dinner in December in addition to our normal meals. Make this your venue for the office party or family gathering. To celebrate our first year in business Truffles will serve a lobster every day between Wednesday 21st and Saturday 24th August. If any remain, a lobster dish will also be available for our popular Sunday Buffet Lunch on 25th August! Having spent much of their lives in distant lands (and an episode involving pirates! 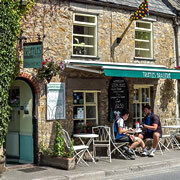 ), Richard and Barbara Sorapure of Bayford purchased the empty shell of Truffles in Bruton in 2012 and have been busy transforming it into a dynamic French Bistro Restaurant. 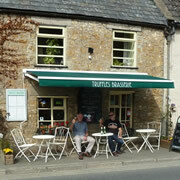 Make a date with Truffles in Bruton and try our acclaimed Sunday Buffet Lunch! 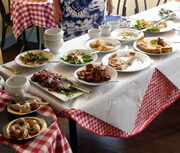 From 12pm Truffles offers a range of hot and cold buffet dishes. Great value for £12.95 per person, (Children £6.95), including desserts and cheese. 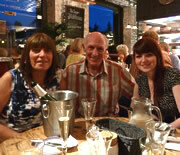 Bring Dad to Truffles fabulous Father's Day Lunch on Sunday 16th June! A lavish three-course meal for £18.95 - less than the cost of our best selling claret! Truffles can only seat 30 covers so make sure to book early. Wincanton is twinned with Gennes in France where May Day is still a Public Holiday. Truffles Restaurant will run a celebratory May Day Special Dinner on May 1st. Anyone from Gennes visiting Wincanton will be made most welcome! 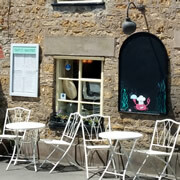 Truffles in Bruton will be open for Easter Sunday lunch and for all subsequent Sunday lunches as there seems to be a demand from customers for a reasonably priced roast in a non-pub setting. Truffles Restaurant & Bistro in Bruton, offering authentic French rustic dishes from locally sourced seasonal produce, reopened in August under new ownership after a three year break. Join us for a French Mothering Sunday menu on 10th March.